The purpose of this map is just to give you an idea of the distance from Athens to Crete and doesn't include all other islands or sea side villages that we are going to visit during our sailing trip. The final route will be decided last week before departure based on weather forecast and your individual preferences. Are you ready for a completely different sailing experience? One that will fill you with numerous wonderful pictures and strong emotions and that will bring the explorer that is hidden in you up at the surface? If yes, we are so glad you do! Diaplous Yachting offers to you “Athens – Crete Sailing Adventure”, a special sailing route that reaches Crete, the largest and most populous of the Greek islands, which was once the centre of the Minoan civilization (c.2700-1420BC), currently regarded as the earliest recorded civilization in Europe. But this is not the only reason to visit this very special place. The unique geographical position of Crete in the southern part of the Aegean separating the Aegean from the Libyan Sea and its strategic importance was the reason for so many wars that have taken place and different conquerors that were settled in this area (Roman Empire, Byzantine Empire, the Emirate of Crete, the Republic of Venice and the Ottoman Empire before unification with Greek state in 1913). What is really important for today’s visitors is that the influence of all the different invaders across the time is depicted almost everywhere from architecture, culture and festive to local cuisine, even in spoken language making thus Crete a priceless diamond at the heart of the Mediterranean Sea. “Athens – Crete Sailing Adventure” is a two-week sailing trip that starts from Alimos Marina and after few days of sailing reaches Crete (either Chania or Heraklion) before heading back to the marina. The exact route that we follow with all different islands that we will visit is decided few days before the departure in collaboration with you in order to have the latest weather forecast in our disposal. As already mentioned this is a two-week charter. This way the trip is not stretched and gives you enough time to get the most out of the places that we will visit, which is aligned with our overall philosophy in Diaplous Yachting. The particular trip is available only with our 45 feet yacht,” Sea Melody”. The reason for this is that the distance that we need to cover is longer than usual sailing itineraries and we want to make it as comfortable as possible for you. The trip is available in April, May, June, September and October. During July and August strong north winds blows in Aegean (meltemi) making it difficult to head back from Crete to Athens. Longer distances of the trip may be covered during night. This way we cover a big distance while you don’t miss anything important and arrive at the destination next day to take advantage of the natural light. This is the reason that at this trip there are always two professional skippers onboard. 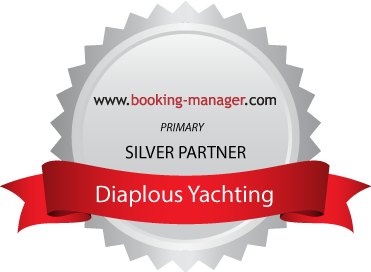 This guarantees to you the best possible time management in regards to the execution of the trip but also absolute safety which is our primary concern in Diaplous Yachting. Since there are always two professional skippers onboard there is a cost of 150€ / day for the second skipper which is not included at the price list of all other destinations in Greece. In addition to this, the distance from Athens to Crete (more than 140 nautical miles at straight line to Chania) means that we will have bigger fuel consumption than average sailing trips. For this reason, there will be an extra charge of 200€ for the two weeks of the charter for the yacht in total. In any case it will be a real pleasure to send a message and give us the opportunity to reply to any queries. Heraklion Fortress: The imposing medieval fortress of Koules still stands at the beginning of the western breakwater of the modern port of Heraklion. Its real name is Rocca al Mare, named so by its Venetian founders. The fortress that we see today was built in 1540, at the exact position of an older one. But soon the Venetians realized that the old fortification of the port with one tower was insufficient, especially after the discovery of the gunpowder and the invention of cannons, so the decision for a bigger and stronger one that would meet their needs was taken. When the construction finished, an architectural masterpiece emerged. Cretan cuisine: is renowned both in Greece and internationally for its unique ingredients and flavours. The core of the Cretan cuisine consists of food derived from natural sources, whereas food of animal origin was more peripheral in nature. In general, people consumed seasonal products, available in the wider local area, which underwent minimal processing or none at all. Based on simple techniques, it’s the variety of local produce that distinguishes the dishes: mountain herbs and greens, bulbs, unique cheeses, fresh fish, the famous Cretan oil, and raki a bracing grape brandy. Bavaria 45 Cruiser "Sea Melody"
© 2016 Diaplous Yachting. All Rights Reserved.